Kidjo’s accolades include a 20 year discography, two Grammy Awards, thousands of concerts around the world and being named “Africa’s premier diva” (Time Magazine) and “the undisputed Queen of African Music” (Daily Telegraph). 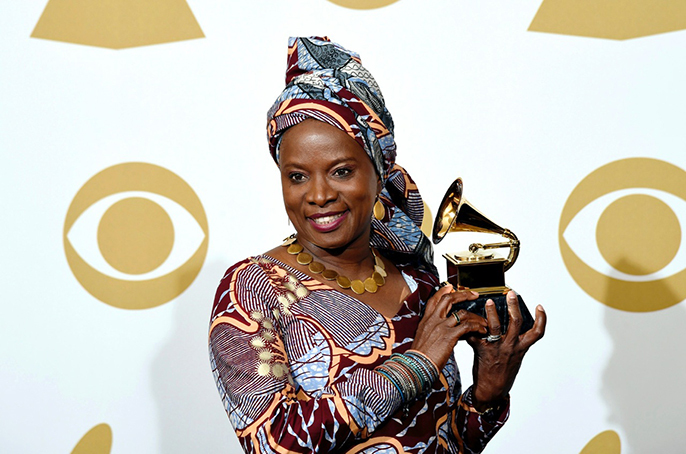 In addition to winning the Grammy for Eve, Kidjo’s 2008 recording Djin Djin won a Grammy for Best Contemporary World Music Album and her last studio recording Oyo was nominated in the same category. She has enjoyed a long history of notable collaborations with greats from the jazz and pop worlds—including Carlos Santana, Bono, John Legend, Josh Groban, Peter Gabriel, Branford Marsalis, Dianne Reeves, Roy Hargrove and Alicia Keys. In an expansive career marked as much by extraordinary musical achievement as passionate advocacy and philanthropy for her homeland of Africa. Angelique Kidjo has found many ways to celebrate the rich, enlightening truth about the African continent’s women beyond the media spotlight. In her biography “Spirit Rising, My Life, My Music”, published in 2014, Kidjo shares her expansive career marked as much by extraordinary musical achievement as passionate advocacy for Africa. Kidjo will release her new album “Sings” on 31st March 2015.